How Do You Know When Wild Salmon is Done? Wild salmon is a truly versatile fish that can be cooked (or cured!) any number of ways. If you follow a majority of the recipes on the internet, you’ll learn the hard way that your wild salmon can be overcooked in just as many ways; which is because many salmon recipes are designed around the fattier, farmed fillets. Wild salmon is cooked sooner than its farmed counterpart, so you can’t simply follow any given recipe to determine when your salmon is cooked. That means you will need to keep a close eye on your fillets to max out their intense flavor and sublime texture. As a general rule, wild salmon reaches medium-doneness when the flesh flakes easily, but this doesn’t apply to all preparations — and some methods are less forgiving than others. The good news is that any home cook can learn when their wild salmon is prepared perfectly, no matter how you do it. From cold to hot methods, here’s a crash course on how to know when your salmon is done. You might be intimidated by the idea of curing salmon*, but it’s an easy and foolproof way to prepare your wild salmon — and will also last in your refrigerator for weeks. Knowing when it’s done is simple: your fillet of salmon is sufficiently cured when it feels firm to the touch, indicating that your salt mixture has done its work; the water and juices stored in the flesh have been extracted and replaced with the flavors you’ve packed around the fillet. If it’s not yet firm, simply wait another day for it to finish curing. Depending on the thickness of your fillet, this can take anywhere between 48 and 72 hours. Unlike other methods of salmon prep, you don’t have to worry about overdoing your fillet since leaving it in the salt cure too long isn’t going to hurt it. *Though cured fish is “cooked” by acid, it is still considered a raw form of seafood. Officially, we cannot recommend that you eat our salmon raw; and are required to inform you that consuming raw or undercooked seafood and shellfish may increase your risk of foodborne illness. There's a physiological change that wild salmon experience when they move from fresh water to salt water (and back again), which makes them more susceptible to parasites found in fresh water. While we follow modern flash-freezing processes that help to kill off the parasites, we definitely recommend cooking our salmon before eating it. Here's an article with a few more details on our thoughts behind this. Poaching is a gentle method of cooking that is a match made in heaven for the leanness of wild salmon. Start your salmon in cold-poaching liquid and bringing the water up to a steady 170 °F over medium heat. The easiest way to do this is to have a candy thermometer that hooks on to the side of your pot or saucepan, but you can use any kitchen thermometer to find out where your range’s sweet spot is for poaching salmon. If it’s your favorite way to cook your fillets of salmon, you may even want to make a mark on your oven dial so that you don’t have to deal with the water temperature in the future. The other temperature you’ll want to keep an eye on is the temperature of the salmon fillet itself. Start checking around the 15-minute mark, but know that it can take up to 20 minutes to finish poaching. Baking salmon is the classic way to cook a no-fuss dinner, and knowing whether or not a fillet is done is as simple as sticking a fork in the thickest part of the fish to see if the flesh flakes easily. No matter what temperature your oven is set to, flakiness is the sign of a perfectly cooked fillet. 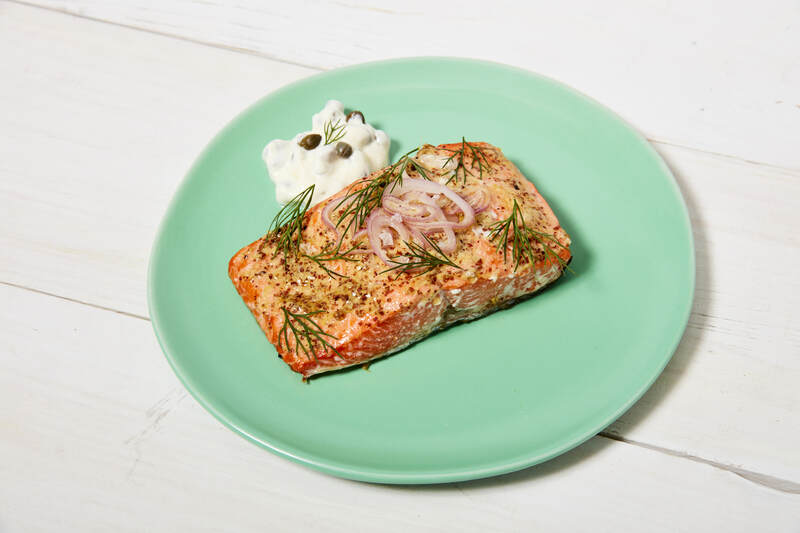 Here’s a really easy way to bake wild salmon: using a low oven temperature of 250 degrees and a “blanket” of herbs and olive oil, a single 6-ounce fillet of salmon will be done at the 20-minute mark with very little chance of being overcooked. Larger or thicker portions may need a few extra minutes, so if the fish isn’t flaking easily, leave it in the oven a little longer and check again after a minute or two. Keep in mind that baking at higher temperatures is less forgiving if you leave your fillets in too long, but your fish will be done faster. Pan-frying your fillet is the fastest way to get your salmon onto your dinner plate. Luckily, it’s also ridiculously simple and requires only a minute or two of active prep — heat up your cooking oil, patting dry your fillets and seasoning them. Wild salmon doesn’t need to be on a hot pan for longer than six or seven minutes, being flipped once as soon as your first side is golden brown. Your salmon will be done after it is firm to the touch, so carefully press on it with a finger to feel this out then stick a fork in it to see if the flesh flakes easily; as soon as it does, remove from heat and serve immediately. Check out this fisherman-style salmon recipe if you want to fantasize about how salmon tastes moments after its been pulled in from sea — it’s literally how Alaskan fishermen prep their catch while working long days aboard their vessels. Broiling salmon is the proper way to cook salmon that has been prepped with a glaze. Exposing the sugars in the glaze of your choice to the high temperatures of an oven broiler leads to a caramelized, tasty treat in a matter of minutes. The high temperature can also end up drying out your fillet, so don’t stray too far from your kitchen while your salmon is under the broiler. You’ll want to check on your wild fillet of salmon at the six-minute mark using an instant-read thermometer. Check the internal temperature of your fillet at the thickest part of the fish. If it reads 131 °F, it’s done. If not, let it cook some more and check again after a minute or two — it shouldn’t take more than eight minutes to cook, but it all depends on how hot your oven runs and how thin your fillet is. If you like your salmon on the rarer side, aim for 125 °F. As soon as you hit your mark, remove the fillet from the oven and transfer it to a serving plate or wooden board, allowing it to rest uncovered for about ten minutes. As with other meats like steak and pork, resting your salmon allows it to cook a bit more while ensuring that it retain its flavorful juices.